This question has plagued avid preppers since bug out bags began their popularity, and for a good reason. Should you pack more weight into one BOB, should you have multiple BOBs for different scenarios, should you skimp on some important items in order to lower your weight for one bug out bag? The only way to answer it is to ask yourself how prepared you should be. If you’re like me, you’ll want to be prepared for any SHTF scenario. Bug out bags are meant to sustain you for between three and seven days, any prepper knows this. What some fail to take into consideration, however, is what items they’ll need for different situations. How are 50 spare shotgun shells (or any other type of ammunition) in your bug out bag going to help you when all you need is to get away from a major natural disaster? You definitely should have more than one bug out bag. In this article, I’ll explain why. Not every SHTF situation is the same, therefore there is no single packing list that can prepare you for every disaster without having to carry 60lbs or more. Since nobody wants to have to carry that much weight, especially for long distances, multiple bug out bags may be the simple answer to a complex question. This category of SHTF situations includes post-collapse panic, mass-terrorism, or any other violent situation that could happen. Obviously, this is the worst-case scenario for preppers, so your bug out bag will be substantially larger. If this type of situation should ever present itself, you may need to bug out for long periods of time. Due to this, your bug out bag needs to be focused on various survival items geared towards this. If a violent SHTF scenario should happen, you’ll want your bug out bag to primarily be self-defense based. This is so you can defend yourself, and whoever else may be in your bug out group from the mass-panic that will almost surely ensue. On top of the self-defense aspect of this BOB, you’ll also need isolation survival equipment. This is because you’ll want to avoid the general population as much as possible, to avoid unnecessary danger. Isolation survival can be brutal, so make sure you don’t skimp on any crucial survival tool or equipment. I would much rather be prepared for any wilderness survival scenario, than have to constantly improvise because I neglected to pack certain items. 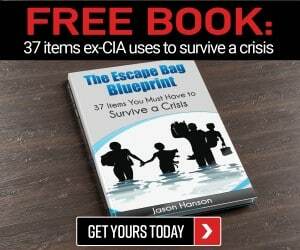 If you were to pack this list into a bug out bag with various items for other SHTF scenarios, you would be left with one hefty bag, which would be grueling to carry for long distances. This category of SHTF situations includes mass storms, flooding, or any other type of natural disaster that would make you to evacuate your home. This specific bag should have items necessary to sustain yourself or your family in the wilderness, or another isolated area until help can come. These items include a tent, sleeping bag, food, and various gear. If the disaster is bad enough, you may not have the luxury of a vehicle, so you need to be prepared to walk on foot if necessary. Due to the nature of the disaster, you may not need to gear this bag toward self-defense primarily. While you should never skimp on self-defense items, you won’t necessarily need as many geared towards it like you would with a violent SHTF scenario. Most of the time, people won’t be in such a “kill or be killed” mindset if their home was just destroyed by a massive storm system. You can’t eat bullets, so you should definitely gear this bag towards resources, since they may be limited. This type of SHTF scenario is commonly overlooked by preppers. Many have bug out bags for situations like collapses, or major disasters that affect large areas. What if your house burns down, or another disaster destroys your home? More than likely you won’t need to sleep in the wilderness during this time, since you will commonly have access to a vehicle, or a means to escape. However, you’ll still need various items to get back on track. Having a bug out bag in your vehicle is an incredibly smart way to make sure you have more supplies in case SHTF. If you’re an avid prepper, and you don’t have some type of SHTF bag in your vehicle, you really need to reevaluate your prepping choices. Vehicular bug out bags are a great way to make sure you don’t have to carry heavier weight for long distances. Granted, if you do take your vehicle on a bug out expedition, you’re not going to be carrying any bug out bag while you’re in the vehicle (because you’ll be driving). However, if you have a vehicle at your disposal while you bug out, you will definitely want to have more supplies that you can have at your disposal when you bug out. Another big reason why you’ll want to have a bug out bag in your vehicle, is if you have to bug out immediately while you’re driving. SHTF scenarios can happen at any time, in any place. Who knows, you could very well be driving home from work when it happens, and you don’t have time to return home to grab your main bug out bag. This is especially true if you reside in the inner city during a violent revolt, or even a riot. Types of disasters aren’t the only considerations that you need to take into effect when it comes to bug out bags, it’s also the number of people you’ll have bugging out with you. While everyone’s family is different, you need to really ask yourself “who can carry what?”. If you have a new family with one or two newborn children and a wife, looks like you’re going to have to carry the majority of the weight. If you’re lucky, you’ll have a few people in your bug out group that can carry their own fair share of weight. If this is the case, you’ll want to have at least one “community bag” that will have the basic necessities for survival, and not much else. This bag will generally be carried by the person who can move the most weight, as it will be the heaviest. Other people will have bug out bags that suit their individual strengths. An example of this, is if you have a group with people who are great at different aspects of survival. If you have a person in your group who is more medically inclined, they’ll have the “doc” bag. This bag will include the majority of trauma-geared items, as well as medication, and various other items that could become useful medically. While this bag may have a lot of medical items, every person should have their own small medical kit in their own bag, in case the group becomes split up. Another bag you might want to consider, is one geared towards cooking. While you may not do a whole lot of cooking in your initial bug out expedition, your bug out location might make you need to find your own food. Since nobody wants to eat disgusting food for long periods of time, think about possibly having one person in your group carry cookware, fire materials, spices, etc. 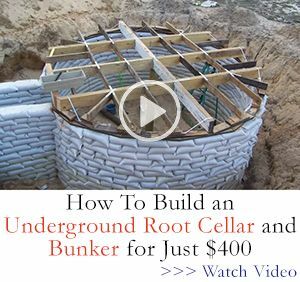 This method should only be used if you have a family with the numbers that allow you to do so, or if you have a bug out group with the numbers to support the method. This is easily the most effective method, as it distributes items equally, and plays to the specific strengths of each individual person. Individuality is extremely important when it comes to stressful situations, as it causes the person to have their own sense of self-worth. 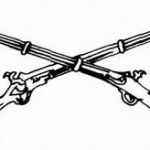 In my article on how to combat stress, I discuss different techniques to help battle stress that you may feel when SHTF, and I will add this on to it. 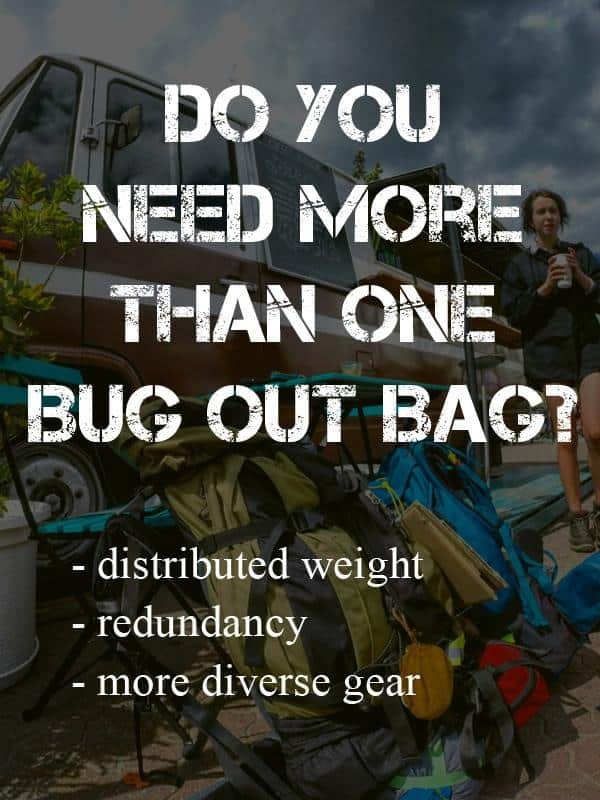 While this may not specifically mean that you’re the only person who will be bugging out, it may mean that you’re the only one capable of carrying weight in your bug out bag. Even so, you’ll want at least two bug out bags. I would keep them fairly similar in this instance, because you always want a backup of anything you have. Remember, two is one and one is none. If you’re lucky, your wife (or husband) may be able to carry the spare bug out bag as well. Never limit yourself to only one bug out bag, otherwise you risk not having one at all. The reason I say this, is that the world is full of thieves. Odds are, you’ve probably had company over at some point, more than likely people you trust. Due to the fact that you’re probably prideful of the fact that you’re an accomplished prepper (or the fact that you’re just starting out), you probably showboated your bug out equipment, including your bug out bag. When people become desperate for supplies, even your closest friends may turn against you. Stress and panic will cause people to do unspeakable things. Stealing from a friend is the least worrisome of the things that people are willing to do for survival. Always have a backup bug out bag on standby in case your other one gets stolen. Another aspect of lone-wolf prepping, is if you have a bug out location. If this is the case, you’ll want to have another bug out bag inside of that location, if it’s secure. This is so you have more supplies that you can replenish on in case you lost, or broke other supplies on your way to your location. More than likely, you will use (or lose) a good bit of supplies from your initial bug out bag during your expedition. Due to this, you’ll want another bag that you can have as a fail-safe when you arrive safely. Also, you never know if your initial bug out bag will get damaged along the way. 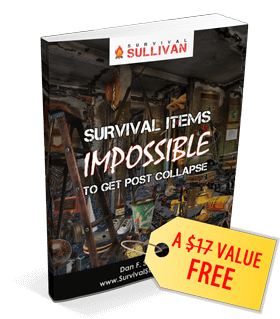 If you didn’t read the article “The Best Survival Backpack” by Survival Sullivan’s founder himself, odds are you may be risking having a cheaply-made backpack because you wanted to save money. While there are many backpacks of decent quality that may not be listed in his article, the ones that are listed are definitely of high quality. If your initial bug out bag is damaged during your expedition to your bug out location, you’ll want another bag that you can use if you need to leave that location in a hurry. You never want to be caught “with your pants down” in an emergency situation, isn’t that why we’re preppers in the first place? Don’t skimp yourself, be prepared. I could literally go on for hours as to why you should have multiple bug out bags, but I think you get the point. If you find yourself wondering, think of a few “what if’s” in your head. Odds are, you’ll more than likely convince yourself to prepare more than one bug out bag. Remember, different SHTF situations may call for different types of bug out bags, as well as what’s inside of them. Due to this, it’s best to have at least two bags to choose from for violent and non-violent SHTF scenarios. Play to your group’s strengths, as this will greatly increase your group’s chances of survival. Teamwork is crucial to surviving a major disaster, and your team’s bug out bags are no different. While each bug out bag should have the basic necessities for survival, each person should also have supplemental items that they are efficient with that can benefit the group as a whole. Never put all of your eggs into one basket, however, as this could cause a major disastrous situation should one bag get lost. Having at least one bug out bag in your vehicle is an excellent supplemental method that can really help you should SHTF if you can get to your vehicle in time (and are able to drive it). While I wouldn’t put the most expensive or crucial survival items in your vehicle (in case it’s damaged), I would store the heavier items in it, as well as supplemental food. In short, multiple bug out bags are highly recommended by me, and by Survival Sullivan. In my line of work, I’ve learned that it’s best to be prepared for any situation, and not to be caught blind-sided. If there are any other reasons that you could see being crucial for having multiple bug out bags, please leave a comment below! Next Free Range Children: Could Your Kids Survive SHTF On Their Own? Great article,,,,,,,have seen many instances where folks put all of their eggs into the proverbial one basket. ,I have had multiple bags for years at my home, on my ATV’S, in the boat, in my vehicles, next to my gun cabinet for defense, in my Police car, and in my office. Every bag has the same basics, but each is set up for specific placement. I have attempted to set each bag up to compliment what my everyday carry is in accordance to where the bag is. For instance, if i am mowing the yard, I am going to have very little on my person for edc, so my home bag will be complete. However, if I am hunting, I will be pretty well equipped with my edc, so that bag will have different gear than the bags in my home. Same with my vehicle bag, I have the basics in each vehicle, plus a bag, so i can gear it differently than having nothing in the truck. I have found I do not have to spend hundreds of dollars per bag if you watch garage sales, auctions, estate sales etc. I love when i find a great find at a garage sale! My wife used to think I was a little wacked for having multiple set ups, but not anymore! I am kind of lazy, so having each bag pre-built to my activiy saves me work in the long run! Having multiple bug out bags has also allowed me to pass on set up bags to family members and others without so much trauma to myself! I have nieces and nephews that have placed caches on the route of their 30 mile school bus commute in case they have to get home from school the old fashioned way. I have been fortunate to be able to pass on some extra equipment for them for this project. Love the article, thanks for your website.